(peaks on 12/13th Aug). This year is a good chance to see them as the sky will be moon free, meaning it will be nice and dark and ideal for observing if the weather plays along. Very observant people might have noticed a thin crescent Moon just visible in the bright sun-drenched afternoon sky on Monday (18th June). Those that looked even closer would probably have been surprised to see what would have looked like a star beside it. This was the planet Venus, shining so brightly that it was visible to the naked eye even in broad daylight. If you looked at the wrong time though Venus would not have been visible as it disappeared behind the Moon for an hour or so. See below a sequence of photos showing (left to right) the before, during and after views of this daytime "eclipse". 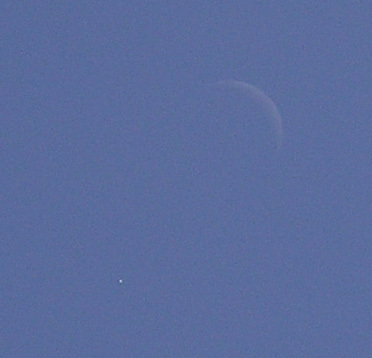 Looking closely at the photo you'll see that Venus is currently crescent shaped. This crescent will become thinner and longer over the coming month as the planet comes closer to the Earth and more into alignment between the Earth and Sun. By mid July binoculars will clearly show this crescent shape. Another sight to watch out for in the near future is the close encounter of Venus with Saturn in the late evening sky on 31st June and 1st July. As the summer nights shorten over the coming month we'll be treated to plenty of opportunities for evening views of the planets Venus, Saturn and Jupiter, with Mercury also joining the show for a short while. These planets are all visible to the naked eye and should be easy to identify, but unfortunately they will be quite low in the sky so a fairly clear horizon will be needed. Venus, Saturn and Mercury (& occasionally the crescent moon) can be seen lined up in the north western sky shortly after sunset and the giant planet Jupiter can be seen rising to low above the southern horizon around midnight. This months newsletter is packed with information that will be useful to anyone new to looking at the night sky. Lots of links to useful web sites and photos from the Caithness night sky. In May there is a visitor in night sky as Comet 73P/Schwassmann-Wachmann 3 passes earth. This May sees a favourable flypast of this interesting comet which fragmented during its 1995 circuit around the Sun. The brightest fragment (component C) will pass closest to the Earth (a mere 6.5 million miles!) on the 12th May. On this evening the Moon will pass into the Earth's shadow and "disappear" from view. This will be about as good an opportunity as you'll get for observing this phenomenon. It begins around 2130hrs and lasts until approx 0115hrs with the Moon totally eclipsed for just over an hour in the middle of this period. This event can be clearly seen with the naked eye. Occultations (the Moon passes in front of other celestial objects) - On the 23rd of February 2007 (approx 2200-0000hrs) the Moon will pass in front of the Pleiades star cluster resulting in the stars disappearing from view and then reappearing on the other side of the Moon about an hour later. Binoculars will afford a good view of this. - During the early hours of the 2nd of March (approx 0220-0250) the planet Saturn will be occulted by the Moon. A small telescope will give the best view of this ringed planet temporarily disappearing behind the Moon. Whilst viewing the above events there is time to look for the detail described in the attached Lunar guide. The Moon truly is an interesting and easy object to observe and is well worth a close look. Gordon Mackie said,"I took tonight (9th) & it shows the unmistakably brilliant planet Venus shining alongside the fainter planet Mercury. For the next 4-5 days the pairing can be seen side by side, low in the western sky shortly after sunset. By next weekend Mercury will become too close to the Sun to be visible, leaving the prominent Venus on its own in the sky at sunset for the next few months. After spotting these two planets turn and look east to find the bright planet Saturn rising above the eastern horizon." This comet is clearly visible to the naked eye very low in the sky near the Sun just before sunrise (SE) or at sunset (SW). Attached are photos of it taken as the sky was brightening on the morning of 8th January. Unfortunately it will soon (by the end of this week) be too close to the Sun to see it. You'll need clear skies similar to those on recent mornings to see it - good luck! 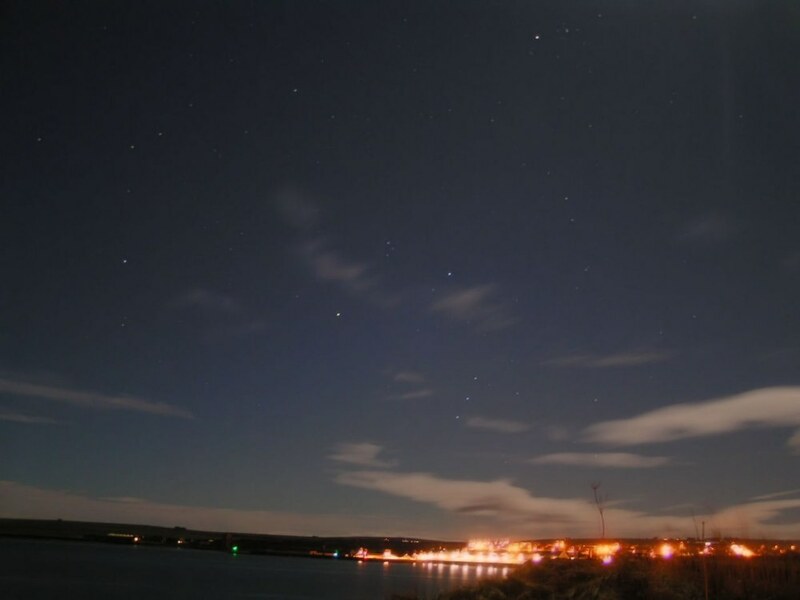 Stewart Watt send in this photo of Orion over Thurso taken on 3 December 2006. - anyone with binoculars or a small telescope will be able to view these objects in similar detail. Click the link for a guide giving some of the highlights to be found in the winter night sky. This will be useful to anyone that received a telescope/ spotting scope or binoculars for Christmas and wants to know what in the night sky would be interesting to look at. Gordon Mackie has sent in a photo of the constellations of Perseus and Cassiopeia. The Milky Way runs through these constellations, so a sweep with binoculars will not disappoint. 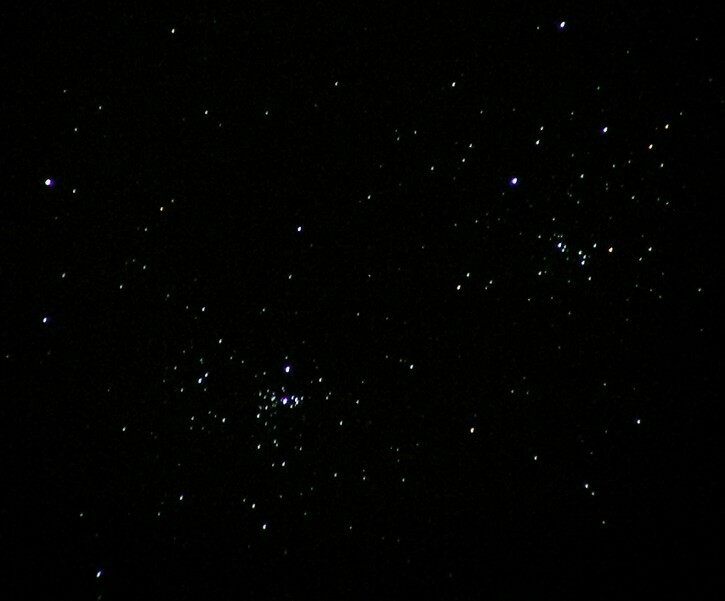 One particular area to check out with binoculars or a small telescope is marked on one version of the photo - this is where The Double Cluster (NGC 869 and NGC 884) can be found. 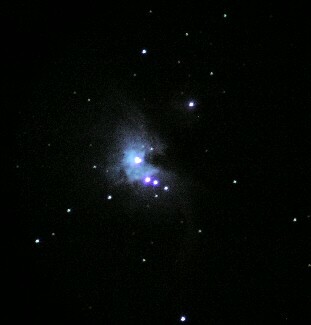 In clear skies it can be spotted with the naked eye, but its true glory is only revealed with optical aid. Have a look. Welcome to the Caithness Night Sky. Gordon Mackie has long been interested in astronomy and has kindly offered to contribute to this new section. This section will consist of a bi-monthly newsletter with photos and information about what might be seen in the night sky over Caithness. 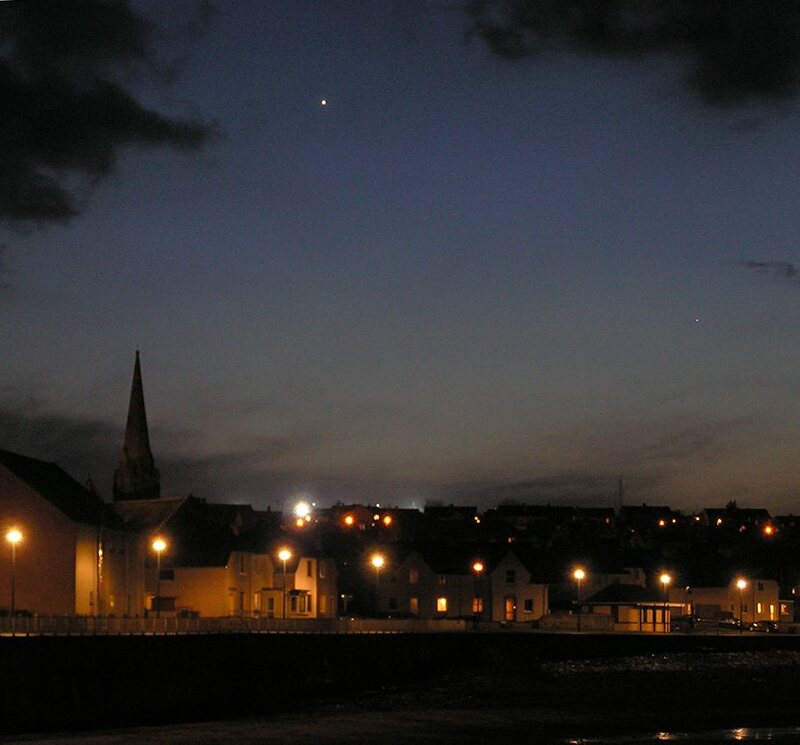 A photo gallery will shortly be added where anyone can send in their photos of the Caithness Night Sky. Gordon has offered to answer questions which can initially be emailed to bill@caithness.org for forwarding. To start the section going Gordon has prepared a February March 2006 newsletter with details of what he has seen recently. He starts by including items that can easily be seen with the naked eye or binoculars. If there is enough interest Gordon will move into more technical descriptions at a later date. At the end of the newsletter are details of events or items to look out for in coming weeks. Anyone can contribute to this new section and Gordon is keen to stimulate interest. Let us have your suggestions and ideas and we will consider them. 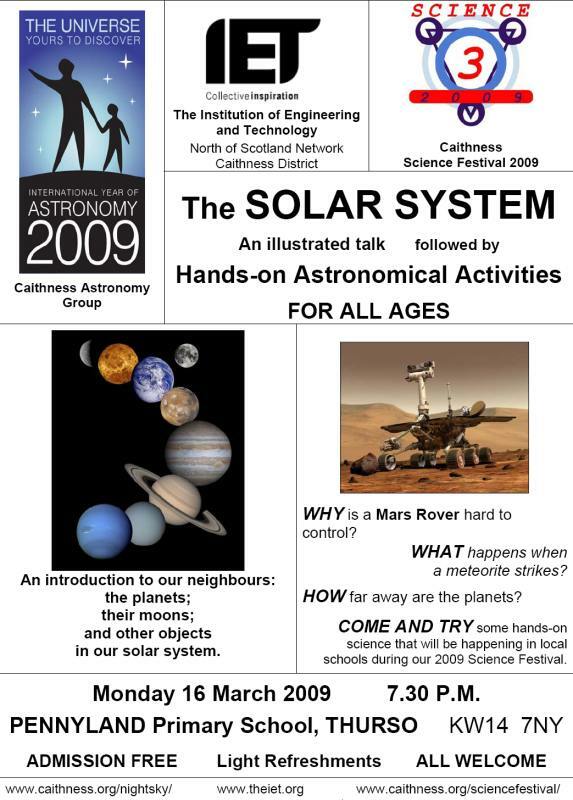 The Caithness Astronomy Group present another chance to find out more about our Solar System on Monday 16th March at Pennyland Primary School, Thurso. An illustrated talk followed by Hands-on Astronomical Activities. This evening runs as part of the Caithness Science Festival that takes place between 16th and 20th March. As part of their International Year of Astronomy events Caithness Astronomy Group would like to encourage budding local astrophotographers to submit entries to the competition. The closing date is 29th May 2009. 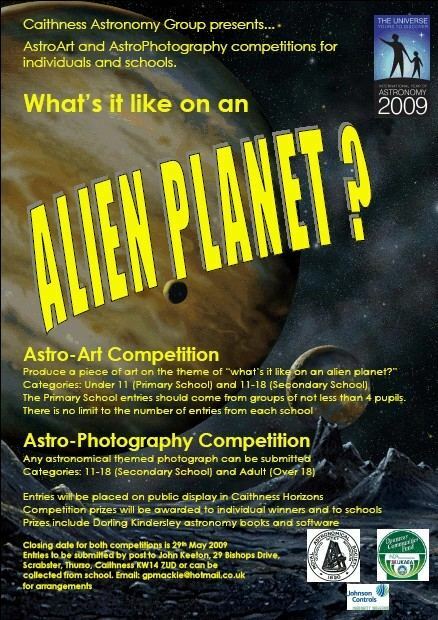 Astro-Art Competition - Produce a piece of art on the theme "What it is like to be on an alien planet" See poster for ages and groups. 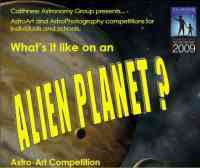 Astro-Photography Competition Any astronomical themed photograph can be submitted. See poster for age groups. Links to the BBC programmes and packed with information. You have not got enough years to live to see it all here. Fantastic site with so much to see.